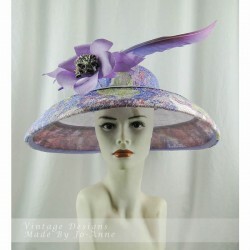 Lilac Sinamay, Lace Brocade Deep Brimmed Hat. Hand dyed, Floating Feather and Silk Floral Motif. Star Bright Edging. Hat Life in 2012, HATalk 2015, Colembally Taste Festival Art Prize 2016, finalist MIMC 2017, Royal Melbourne Show 2016 and 2017.